As the Friday inauguration date draws near, most ordinary Americans who read, stay informed, pay attention to history and events, and engage in critical thinking are, understandably, aghast at the poor job Mr. Trump has done so far in putting together a workable Cabinet of high-level appointees with the expertise, experience and values that can lead the country. Betsy DeVos--Trump's choice as education secretary-- is a billionaire heiress (ie., another one born with a silver spoon in her mouth) who has no experience in running major programs (the student loan portion of the Education portfolio is a trillion-dollar budget with enormous complexity), shows little understanding of the broad issues in education, has never supported public schools, and has wrecked Michigan's education system by funding a multimillion-dollar initiative pushing support of for-profit charter schools that siphon off public dollars for the private enrichment of corporate managers, provide public dollars for religious education, and remain totally unaccountable to the taxpaying public while performing abysmally in their job of educating students. Not surprisingly, at her confirmation hearing she refused to support "equal" accountability for private and public schools. She supports the completely discredited "conversion therapy" for gays and will likely work to reverse the protections won for LGBTQ students based on her personal religious beliefs. DeVos has never taught, has never served on a school board, and has never even sent her own children to public schools or participated in a PTA meeting. She showed at her confirmation hearing that she has little or no understanding of educational issues of importance, such as the Federal laws requiring appropriate education for students with disabilities or nondiscriminatory opportunities for female and LGBTQ students. Her answer on whether guns should be allowed on school grounds was--(a paraphrase) Yes, because who knows, it might be necessary to protect children by shooting at a grizzly bear, and acknowledged that she would support Trump's proposal to ban gun-free school zones. This, in a world where too many toddlers and high-school students have been mown down by guns brought in by students bent on death. Betsy DeVos is anti-public education, anti-teacher, and anti-union--one of those who blame every problem of our underfunded schools on the teachers rather than on the ideological bureaucrats that have siphoned money away from public schools for vanity projects. In the confirmation hearing, she refused to say that she would not work to privatize schools, she thought it would be "premature" to say she would support the rules requiring investigation of college sexual assaults, and she didn't even understand a question from Al Franken dealing with an important educational issue regarding assessment. Her values, in short, are not the values of a majority of ordinary Americans whose children attend public schools, and who want their children's teachers to be decently paid and respected. (She hasn't completed her ethics disclosure yet, but she did omit a $125,000 anit-union political donation from her Senate disclosure form. Not a good indicator of her respect for integrity.) See, e.g., Betsy DeVos, Trump's education pick, lauded as bold reformed, called unfit for job, Washington Post (Jan 17, 2017); Amy Wang, All the vital questions Trump's pick for education secretary couldn't answer at her confirmation hearing, Quartz (Jan. 18, 2017); Some Colleges Have More Students From the Top 1 Percent than from the Bottom 60. Find Yours, The Upshot, New York Times (Jan. 18, 2017) (providing a clear picture of the way privatization of education at the college level has favored the elite). Scott Pruitt--Trump's choice for the EPA--is an Oklahoma oil and gas yesman who has fought for years to undermine the regulatory power of the EPA--suing the EPA 14 times alongside the oil companies during his Attorney General stint-- so that the oil and gas industry can pollute at will without fearing the power of the federal government to reign them in. Fracking in Oklahoma has been clearly connected to a sharp increase in the number of earthquakes near fracking wells, but Scott Pruitt would rather expend state dollars on suing the EPA to try to eliminate regulations meant to protect people, communities, and the environment. Pruitt is a climate change denier who accepts that human activity affects climate but denies the scientific consensus about the pace of warming, suggesting at his confirmation that the discussion of climate change was too "personalized" and not "precise" enough to merit vigorous action; he has financial ties to oil and gas companies and so, unsurprisingly, he wants to use his role as EPA head to prevent the EPA from fighting pollution that endangers every American's health as well as the planet we and other species live on. As pointed out in the confirmation hearing, one of the letters Pruitt sent as A.G. was drafted for him by Devon Energy: he was serving an oil company, not the public, but he claimed such actions were appropriate. Interestingly, Pruitt claims to be in support of state's rights--except when the state's rights run counter to the interests of oil companies. So he advocates state rights approach to environmental regulation, but at the same time threatens to undo California's ability to set its own clean-air standards! Quite hypocritical and demonstrative of his obvious kowtowing to the oil industry. This obsequiousness to polluting industry is NOT an American value. It is the way crony capitalists work together to make the rules work in their favor and the public be damned. The fact that Oklahoma Republican Senator James Inhofe--a person who is notorious;y anti-environmental protection, a climate change denier, and pro Big Business no matter the cost to the environment--support Pruitt assures the American people that Pruitt does not care at all about the potential harms to the environment from removing our current protective regulations and allowing business to do to the American natural resources the same thing corrupt industry has done to China's air, water, and land. See, e.g., Trump's EPA pick casts doubt on California's longtime power to set its own clean-air standards, Los Angeles Times (Jan. 18, 2017) (Pruitt suggests he may not continue the federal waiver that has permitted the state to cut its greenhouse gas emissions from vehicles by about a third in 8 years); Scott Pruitt, Testifying to Lead E.P.A., Criticizes Environmental Rules, New York Times (Jan. 18, 2017) (noting Pruitt's hearing testimony criticizing federal rules protecting air and water and addressing climate change); Earth sets a temperature record for the third straight year, New York Times (Jan. 18, 2017) (take a look at the "How 2016 Became Earth's Hottest Year on Record" graphic showing the rapidly increasing temperatures--it is definitely starting to look much like the "hockey-stick graph" that Republicans] climate-change deniers mocked in Al Gore's "inconvenient truth" documentary, and then type in your city's name in the "How Much Warmer Was Your City in 2016?" graphic to see just how cities are experiencing climate change). Andy Puzder--Trump's choice for Labor--is a constant friend of Big Business and an ideological critic of almost any worker protection, from much-needed minimum wage increases to $15 an hour to a national program that provides insurance for minimum wage earners (the Affordable Care Act) to any other business regulations that, in his view, impede Big Business's ability to make big profits for its owners. Thus, he is directly opposed to the mission of the department he would lead.. As the fast-food executive head of Restaurant Holdings, Inc., the parent company of Carl's Jr., he has demonstrated his view that big companies should be able to use workers however they want to make money for the managers and wealthy shareholders, with little regard for ordinary workers' wellbeing. For instance, the Carl's chain is known for the kind of scheduling that requires workers to show for a 4 hour shift that might result in the worker being sent home after 1 hour because there is lower demand. Consider what that means for ordinary Americans working at these low-salaried jobs. They may have to arrange a babysitter or some other child care every time they go into work. They may have to travel with inconvenient and expensive public transportation systems, or buy gas for a lengthy car trip that ends up not even earning enough to pay for the round trip and other expenses because of the short day. Pudzer even claims that workers who aren't paid overtime "gain in stature and sense of accomplishment" even though they are often paid so little that they qualify for food stamps and other public benefits. See, e.g., Trump's Labor Secretary Nominee No Friend to Workers, Advocate (Dec. 8, 2016) Further, Puzder's company itself has scoffed at labor laws, running afoul of requirements. Id. (noting violations of the Fair Labor Standards Act) . This is NOT American values. Of course, Pudzer has been a donor and adviser to Trump, like many another of Trump's other billionaire crony appointees. These three appointees illustrate that Donald Trump has no interest in "draining the swamp" of crony capitalism that has at times seemed to be much too important in DC. He is actively feeding the swamp monster, with selection of billionaire crony capitalists who want to remake the government to smooth the way for Big Business to do whatever it wants, without protective regulations for workers, the environment, or consumer protection. This is the 4-decade-long Republican attack on ordinary Americans taken to the extreme--deregulation, tax cuts for the wealthy (with hidden tax increases for everybody else), militarization for the military-industrial complex, and privatization of services like education and health care that the government does best because the profit motive ensures corruption and high costs. I have espoused a view in this blog of what I call "democratic egalitarianism". It is a philosophy that government should function in a democracy to help ensure that each citizen can participate in opportunities and that the whole protects the most vulnerable amongst us. I believe that every American w wants our society to move towards a sustainable economy with decent livelihoods for all, good health care for everyone, education that provides opportunities and knowledge that bridges the gap between those born with wealth and the majority of us who are not. And I am convinced that every American who cares about these things should write or call their Senators and tell them not to approve these unfit candidates for the office they have been nominated for. Certainly, no candidate should be approved without a clear slate from the ethics office. Trump himself owes it to the American people to divest himself of his businesses. Putting them in the charge of his children and claiming that he will remain sufficiently unconnected with them is absurdly insufficient. But even more, no candidate should be approved to head an agency about which the candidate knows nothing, and for which the candidate's only vision is destruction of the protections the government provides for the American people from the 'stateless' corporatism that allows Big Business to run amok in its search for rent profits above all else, no matter the long term harm done to the American people..
Today's Wall Street Journal features an op-ed by Kevin Brady, right-wing Texas Republican who chairs the notorious "Joint Economic Committee" that has been a notorious producer of anti-tax propaganda-driven studies over the years of Republican hegemony in the House. See "Tax Reform Needs Accurate Tax Tables", Wall Street Journal (May 6, 2013), at A15. The op-ed spends a lot of time denouncing information about tax rates. It suggests that the entire US tax system is far too progressive in nature, because "one of the most salient characteristics of the U.S. tax code [is] the decreasing share of taxes paid by the bottom 50% of taxapyers and the increasing share of taxes paid by the upper 1%." Of course, Brady mentions nothing about the accelerated growth of inequality of income in that same period, resulting in the upper 1% controlling so much more of the U.S.'s wealth and income compared to that bottom 50%. In fact, the upper group pays less than it should given the enormously increased bite of wealth and income, a fact that Brady conveniently overlooks. The op-ed also talks only about the income tax rates, thus appearing to suggest that the income tax is the only relevant portion of the U.S. tax system and that rates, rather than base, are the most significant factor. In fact, there are a range of taxes--income, estate, payroll, excise/sales taxes. Regrettably, the income, estate and payroll taxes are much too lenient on the highest paid groups. The shrinking of the income tax rate structure (from many different rate levels in the 1970s to our minimal group of rate brackets today) is highly favorable to the highest income group. The rate levels off at less than half a million, while the highest paid CEOs are making 20-30 or 40 million a year. 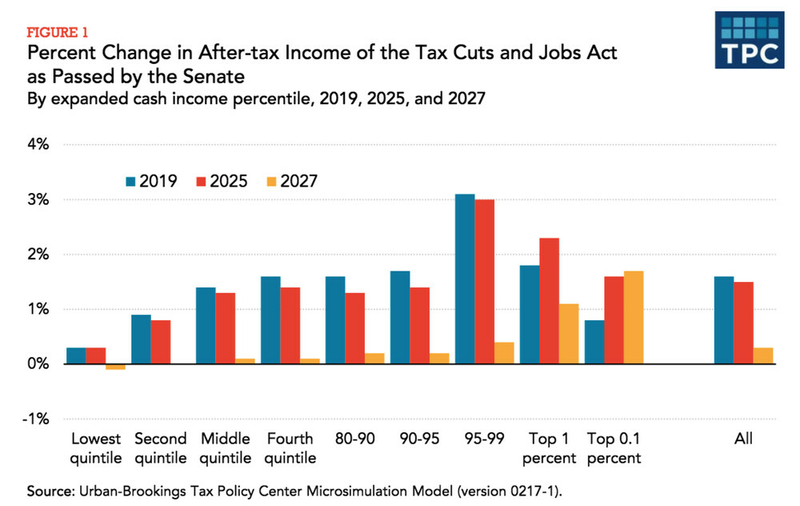 As a result, those in the top 1%--and especially those in the top part of that 1%--are taxed at the same rates as people who make a "mere" $400,000 a year. Further, the base on which that rate is applied to determine tax liability is notoriously laden with tax expenditures that primarily benefit that same group at the top, beginning with the charitable deduction for non-taxed appreciation and continuing through Roth IRAs/ IRAs /generous pension plans to too-high mortgage interest deductions and others. Only those in the top 30% even bother with itemizing deductions. And among those, it is those at the top who garner the enormous benefits of deductions from those tax expenditure provisions. The estate tax is similarly designed to provide special benefits to the wealthy--from the lack of a progressive rate structure that ensures that the wealthiest tycoons who've amassed fortunes from loopholes like the carried interest provision will pay peanuts on an estate hardly taxed during their lifetimes, to the various gimmicks for evading and deferring estate taxes-- including various kinds of trusts,"family" partnerships and irrational "discounts. On the other hand, the sales tax is a mere gnat for the wealthy while its expansion cuts into essential living expenses for the growing legions of the poor and nearly poor. The payroll taxes for the working poor and the middle class take a significant bite out of their labor's rewards, while the wealthy CEOs and directors pay Social Security only on a miniscule portion of their wage income. The most important defect of tax-distribution tables is that they cannot help one to assess how proposed tax changes will affect economic growth. Suppose Congress eliminated the double taxation of capital income by doing away with taxes on capital gains and dividends at the individual level. Current tax distribution tables would depict this change as a reduction in progressivity due to the large share of capital gains and dividends attributable to the top income quintile. But doing away with taxes on capital gains and dividends would significantly lower the after-tax cost of capital for new business investment in buildings equipment and software. New business investment increases the demand for and productivity of labor, driving real wages higher. For households in the bottom 50% of the income distribution, the benefits are significant but indirect--more jobs at higher real wages. Id. The fact is, we have been following this agenda of reducing taxes on capital income for decades. The result has been an unprecedented growth in inequality and the continuing decline of wages for the vast majority of Americans who work for their income. The right's "philosophy" of low taxes on capital and high taxes on labor doesn't work and never will. Brady doesn't appear to much care --his arguments seem designed to justify the right's continuing push for policies that create an oligarchic elite served by an increasingly indebted worker class with few employment rights as the courts favor Big Business over the people this country was founded to protect. Brady's op-ed, in other words, is just another volley in the right's class warfare against American workers. In the late 90s and early 2000s, Jenkins & Gilchrist (J&G) made lots of money promoting bogus tax shelters, often using derivatives and partnerships, to generate phantom losses to offset real (economic) income or to defer recognition of income. The highly promoted but secretive deals had catchy names, like "SOS" (for "short options strategy"), and generated very high fees (based on a percentage of the tax loss generated by the shelters!) from the wealthy individual clients that considered themselves above the (tax) law. In return for the fees, the law firms promoting the shelters assisted the clients in all stages of the shelters, including setting up bank accounts and sham corporations and partnerships as needed, topping it off with a "more likely than not" "get out of jail free" tax opinion.﻿﻿ Download Guerin Donna Sentencing PR. As the press release notes, one such shelter, sold between 1994 and 1999 to almost 300 wealthy individuals, generated about $2.6 billion in fake tax losses. The SOS shelter, sold between 1998 and 2000 to more than 500 wealthy individuals, generated at least $3.9 billion in fake tax losses. And so on. Donna Guerin, one of the partners at J&G (and earlier at Altheimer & Gray) during that period, was instrumental in the design and marketing of the shelters. ﻿ She was originally convicted in May 2011 in a jury trial, but juror misconduct led to the scheduling of a new trial for March 2013. Guerin pled guilty instead of facing trial and was sentenced last Friday to eight years of jail time on conspiracy and tax evasion charges. She was also ordered to pay restitution of $190 million. Not only did she participate in the marketing and implementation of the tax shelters, but Guerin also "took part in the illegal back-dating of certain tax shelter transactions," making more than $17 million between 1998 and 2002 from her illegal activities. Op. Cit. Congratulations are due to Assistant US Attorneys Stanley Okula, Jr. and Jason P. Hernancez, as well as DOJ Tax Division Assistant Chief Nanette Davis, who handled the prosecution of these tax frauds. These promoted shelters reveal the lengths to which wealthy American--and, too often, also their advisers--will go to avoid their personal responsibilities and duties to We the People. Hopefully, attorneys will pay more attention to their duties to the integrity of the courts going forward. And this should be a reminder to all those who claim that "the 47%" don't care about personal responsibility that there is a good deal of evidence about the 1% being negligent of their public responsibilities .